We here at Frock Flicks (okay, Kendra and Trystan) are so excited for the final season of Downton Abbey that we’re doing weekly costume recaps AND podcasts! Tune in each week for an episode-by-episode recap of our thoughts on both the plot and (especially) the costumes (designed by Anna Robbins) — because really, while we all are invested in the lives of the fictional Crawley family, don’t we actually keep coming back to see what they’re wearing? You can find the podcast at the bottom of this post, or on iTunes! Back at the Abbey, it’s time for breakfast. Henry has written and invited the whole family to come see him race! He’s sneaky that way. Edith is in a beautiful, lightweigh knitted sweater top. Mary’s got a beige blouse and cranberry skirt, and the earl is in a brown, tweedy suit. Mary’s blouse has some kind of decorative bands around the cuffs and hem. The lower neckline makes this look not as frumpy as some of her other blouses. Edith’s sweater is paired with a long, beige skirt. Cora is rewearing her light brown with brown and blue embroidered outfit from the last episode. Over at the Dower House, Isobel is confused as to why she’s received an invitation to the wedding of Lord Merton’s son. Granny thinks something is afoot and vows to visit the daughter-in-law and find out … after which, she’s headed to France to calm down after the hospital fight. We love this outfit on Isobel. It’s a nice slate blue color, and the vertical bands on the bodice and lower neckline make it feel very modern. Maggie Smith apparently refuses to wear a corset for this show, and it shows! Although her suit has nice embroidered bands on the jacket. At Lord Merton’s house, Violet puts daughter-in-law on the spot. The dowager figures out that DIL wanted Lord Merton to marry Isobel so that Isobel would take care of him and get him out of her hair. Granny pulls no punches. We’ve seen this ensemble before, but let’s appreciate how great that hat trim is again! DIL is wearing a perfectly period, sheer, floral print, ruffly dress that Kendra hates, because she hates ruffly 1920s. The print is nice and subtle, at least. Cora is worried about Mary and Henry. A LOVELY Japanese floral print kimono on Mary. Violet has Isobel over and tells her about DIL’s shenanigans. She also asks Isobel to deliver a note to the family after she’s left, letting them know she’s on vacation. This outfit is less exciting than Isobel’s last, but it’s very Out of Africa. Love that striped ribbon on the hat! Violet has worn this suit before, too. The embroidered lapels help keep it interesting. Mrs. Patmore is excited — she’s been fixing up her cottage, and she’s ready to start renting it out as a B&B! Mrs. Hughes gets some great velvet flowers on her hat. In London, Edith visits the magazine and invites Laura, her new editor, to join them at the races tomorrow (gee, we wonder what that will lead to…). Edith is rewearing one of her smart business outfits. Laura, the magazine’s editor, is in a great layered dress with a deco print. CUTE glasses — and she’s smoking, showing she is VERY fashion-forward. All the Crawleys are staying at Aunt Rosamund’s house. After dinner, Henry shows up. Edith in gold with matching bandeau. Rosamund’s black dress has great beading on the front and sheer sleeves. Mary is in an unusually plain color compared to her usual evening looks, but the beaded flowers liven things up. More fab beading around the hips. Back in Yorkshire, everyone’s enjoying a day off. Daisy and Mr. Moseley are thinking about their upcoming tests. Andrew confesses that he can’t read, Barrow says he’s been helping him, but everyone ignores that good deed, and the schoolteacher takes over. Andrew in a tweedy suit, feeling all casual with his jacket off. Mrs. Patmore may look very utilitarian, but her blouse does have pintucks on the shoulders. Barrow looks uncomfortable in his brown suit. There’s another buckle on the hip (along with some interesting seaming). AND another buckle on Daisy’s side hip! Back at the Abbey, Carson and Mrs. Hughes actually sit on the family’s furniture. Or course, this is not Carson’s idea. The boys are excited about cars! Laura is in a nice pale print dress with a sea green jacket, but who cares what ANYONE is wearing when Edith is in SUCH A FABULOUS ENSEMBLE. Blue dots! Coordinating coat with matching lining! Lovely seaming on Laura’s hat. At least Rosamund’s print is interesting, and that’s a nice (if subtle) pleated ribbon trim on her hat. Tom and Robert are both in tweedy browns. Here’s Cora from the front. The dress is beaded, beautifully. The colors are pleasing together — it’s Cora’s mauve with some of Edith’s orange. Laura and Tom hit it off! Saw that coming. Mary is VERY posh in her red dress with latticework at the neckline, paired with a white (with delicate black trim) jacket. Super cute round sunglasses! Mary’s white ties her in nicely with Henry’s driving suit. Aaaand, Henry puts on his driving cap, aka the 1920s version of an unfortunate biggins, and suddenly turns into the human equivalent of a sperm! Let’s revel in Edith’s print some more. The red beads are a great contrasting touch. Mary can’t handle the pressure, but we are distracted by that great hat on the extra in the foreground. An accident happens! Everyone fears the worst (Henry), but it turns out to be his best friend. Henry tries to pull him from his flaming car, but no dice — the friend dies. Now we can finally get a clear shot of the great black and white feathers on Mary’s hat. Mrs. Patmore cooks up a plan, and Mrs. Hughes gets her revenge on Carson by forcing him to cook dinner. We feel not one shred of sympathy for Mr. Carson. At dinner that night at Rosamund’s, everyone is super sad. Cora is sad in gold with purple touches. Rosamund is in the same colors, although her purple takes the form of a bias-cut dress with gold jacket. Edith is so sad she’s wearing last night’s outfit. Laura is sad in beige, and Mary goes full mourning in a simple black dress with a lovely fabric flower on one shoulder. Henry calls Mary and forces her to decide whether or not she’s sticking with him. She breaks up with him. Tom tells her she’s made a big mistake. Mary’s dress has an interesting drape in back. Meanwhile, Bertie proposes to Edith! She’s happy but doesn’t say ‘yes’ yet. Mrs. Patmore’s B&B has welcome its first guests, and it’s been a success! The family is back from London. Robert is sticking with the tweedy brown, while Cora is in a dark dress, rust sweater or jacket, and great black and white hat. Isobel gives them Violet’s note telling them that she’s gone away for a while. Isobel is looking very mother-of-the-bride in her super pale lavender suit. The slightly darker contrast color, and the buttons, are a nice touch. Check out that woven pattern on Cora’s hat! More buttons on the back of Isobel’s VERY loose-fitting jacket. Mary is in a long, lightweight knit, cream sweater, long beige skirt, and a wide-brimmed hat. Edith is also in a knit, her’s in very pale grey with a cute cloche. 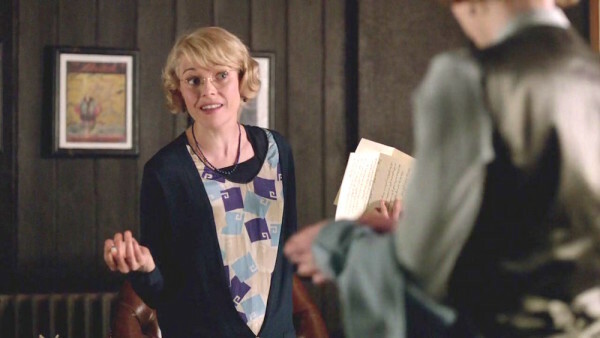 How great was Edith’s print? Do you think Mary made the right call? I enjoyed this episode for so many reasons: Edith’s, Cora’sand Mary’s clothes, Rosamund’s clothes, Laura’s clothes, Henry (*sigh*), Mary’s showing her care for Henry and the fear of losing him, ergo she chickens out. Understandable. But most of all, is that Mary is actually being less snarky to her sister, Edith and Edith’s reaction. Glad of Bertie’s proposal. Favourite clothes: Mary’s dinner gowns, the red dress she wore at wedding, all of Edith’s, ditto Cora’s and Rosamund’s. Tiya is spelled Tiye (Nefertiti’s mother-in-law). I am constantly puzzled by Mary’s hair. It’s perfectly lovely from the front, but then she turns and you see that ugly “beaver tail” in the back! Is this authentic to the period? I too adore Mary’s haircut. 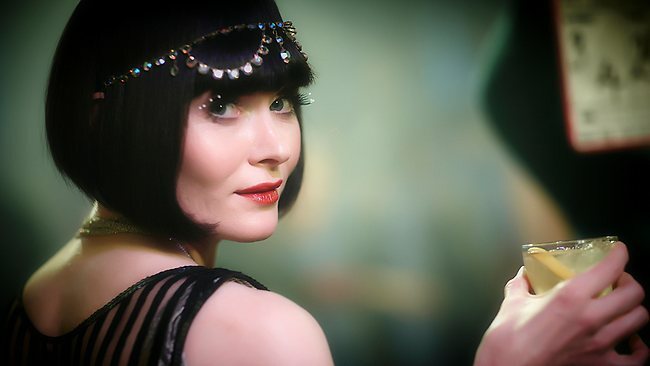 Reminds me of the book covers for Kerry Greenwood’s Phryne Fisher Mysteries. Unfortunately, you must have straight hair to make it work. Any curl and it’s not a pretty sight. Thankfully there were other styles of Bob’s intended for curly hair. You can get that tousled Clara Bow look! Although I love Lady Mary’s look hairwise, I love my hair long. I know that the TV Phryne’s Haiti’s even in the back, but I was speaking about book covers. 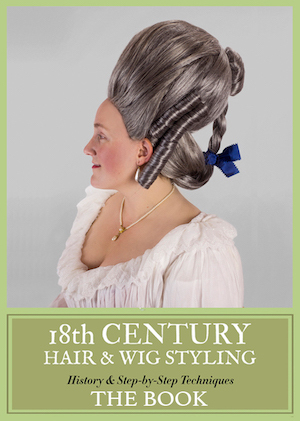 I believe, tho I’m no expert, that Lady Mary’s hairstyle came first and the even back was later. Oh my! I totally have Lady Cora’s straw hat from when she returned to the Abbey after the races. It was originally my mothers and it was purchased in the 80’s and was bought at a little shop in Barbados. I need to pull it out of it’s box and make sure the straw is still in good shape! I loved that hat. My favourite characters on the show are Cora, Robert (yes, I ship Cobert), Mary, Edith, Anna, Daisy, Tom, Sybil when she was alive, Mrs Hughes, Thomas the evil Butler, and Mrs Patmore & of course Lady Violet and Mrs Crawley. I do think that these Ladies have clothes to die for. I love the show — and I was a late-comer to the series; I only just watched almost all of Downton Abbey via Amazon fire. I’m sad to see it ending. I’ve loved watching the changing styles to reflect the period of time over the course of the series – BUT I just want to say of all the characters, I absolutely DETESTED most of Sybil’s ‘frocks.’ Except for a few scenes in the first season, they dressed and fitted Sybil’s character with awful clothing. From her hair to her boat neck shaped blouses, the actresses body type was either purposely frumped up or they did not bother to customize to her body type. Even Edith’s clothes didn’t look as frumpy as Sybil. Also, what were they thinking with Sybil’s hair? Could they not be bothered to accentuate the actresses natural beauty by fixing her up-swept hair a little better? Then when the actress chopped her tresses into a blunt shorter cut, it looked even worse. It’s as if they were trying to downplay “Sybil” so that Mary would shine even more…or the costume dept didn’t have the budget and decided to cut corners when it came to Sybil’s character.